Edible Flakes Market size was estimated close to USD 15 billion in 2018 and the industry will grow by a CAGR of around 8% up to 2025. Edible flakes demand will be chiefly driven by significant growth in ready-to-eat food industry in emerging economies. Increasing global population is treading towards a busy lifestyle owing to which the demand for ready-to-eat and easy-to-prepare meals have increased substantially, given that the lure of not requiring to prepare meals after an exhausted day at work is way too tempting. Taking advantage of the economic and current trends, packaged & healthy food consumption has witnessed a shrill growth in past. The change in dietary pattern and consumption of processed food has surged over the years, which will provide ample growth opportunities to the edible flakes market in coming years. Increasing consumption of highly nutritious edible products in the Asia Pacific is also a growth enabler for the product market. Improving economic conditions and rise in income levels of consumers are another two major factors driving the entire food & beverage industries in Asia Pacific. This in turn will boost the global market in coming years. Growth in world population and increasing per capita income are the major drivers for the growth of food & beverage market. According to United Nation, the population is growing significantly reaching up to 7.12 billion in 2013 and is likely to reach 9.6 billion by the end of 2050. The prime reason for exponential population growth is increasing life expectancy with better medical care and nutrition. This will lead to an increase in healthy processed food consumption, which will further show the upward trend for edible flakes industry. The growth of food & beverage industry is propelled primarily by developing countries including India, China, Brazil, etc. owing to the improvement in economies and upliftment of middle class population. For instance, according to a 2017 study by India Brand Equity Foundation (IBEF), fast-moving consumer goods (FMCG) industry is the 4th largest sector of the Indian economy, among which food & beverage accounts for 19%. The FMCG sector was valued USD 31.6 billion in 2011 and reached USD 49 billion in 2016 with a CAGR of around 20%.High growth in ready-to-eat food industry will create great opportunity for the market. Availability of substitute products including yoga bars, eggs, fresh fruits, yoghurt, energy drinks, etc. and high lactose intolerance in the Far East countries may be the major hindrances to the growth of the industry. More than 50% of the edible flakes are consumed with milk and most of the consumers are unable to digest the milk in morning breakfast due to its high lactose content. On the basis of product, the global market has been divided into corn flakes, wheat flakes, flakey oats, rice flakes and others. Corn flakes are the key product segment accounting for more than 35% of the entire market size in 2018. Surge in consumption of nutritious and protein rich edible products will boost the segment’s growth. Flakey oats segment accounted for more than 15% of the revenue share in 2018 and is likely to grow with a significant rate in future. 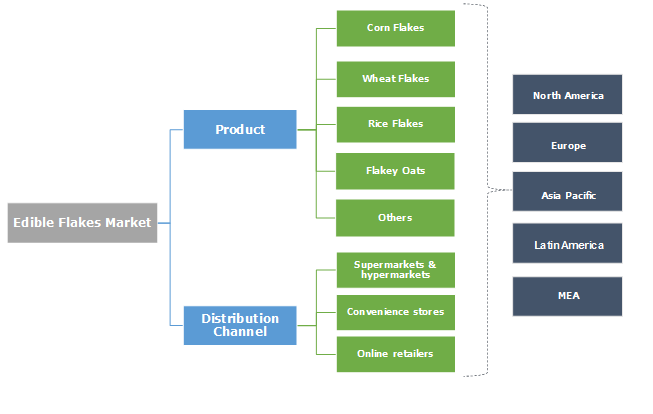 Edible flakes market is bifurcated into three distribution channel which include online retailers, supermarkets & hypermarkets and convenience stores. Supermarkets and hypermarkets distribution channel are a significant and mostly preferred channel in developed regions such as North America and Europe. The segment clutches over 40% of the entire segment in 2018 and will likely grow with a healthy CAGR of more than 6% in coming years. In terms of volume, Europe is a key edible flakes market accounting for more than a third of the overall industry size in 2018. Noteworthy growth in ready-to-eat and low calorie diet food in most of the European countries will be the major factor driving the Europe market over the forecast period. 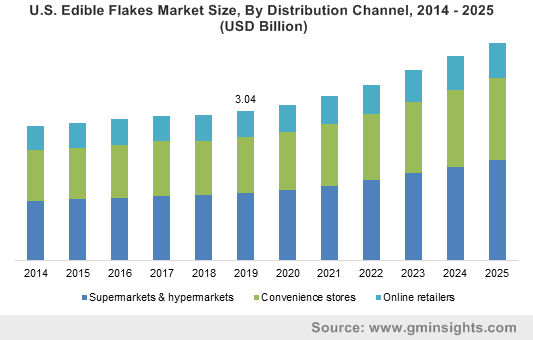 Increasing demand for healthy and convenience packaged food across the region coupled with rising income levels in the Eastern European economies will catapult the regional edible flakes market by 2025. North America is also a significant regional market which generated a revenue of over USD 3 billion in 2018. The edible flakes market is characterized by the presence of a large number of producers spread across the globe. Kellogg's, Post holding company, Quakers Oat Company, Nestlé SA, Dr. August Oetker, H. & J. Brüggen KG, Nature's Path Foods, Baggry's India Limited, Patanjali, Aarrow head mills, and others. Asia Pacific, mostly India and Australia has several medium and small-scale producers catering to demand from local customers. Increasing demand for the products across the developing economies is likely result in many new players entering the edible flakes market in forecast spell. Global edible flakes market size will witness prominent gains in future with swelling consumer awareness regarding the health benefits of the product and surge in desire for low calories and balanced diet. The product has prominence in packaged food industry due to the balanced nutritional value and ease of preparation and consumption. Influence of western culture on dietary patterns and changing consumers foods habits is driving edible flakes market.